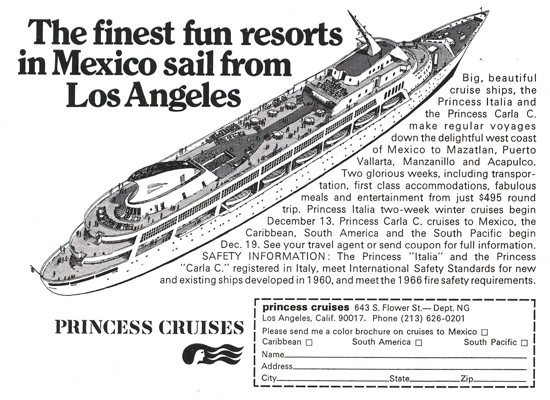 Features: Founded in 1965, Princess Cruises began operations on December 3, 1965, carrying 400 passengers aboard the "Princess Patricia" Turbo-Electric Vessel from Los Angeles to Mexico, calling at La Paz, Puerto Vallarta, Acapulco and Mazatlan. 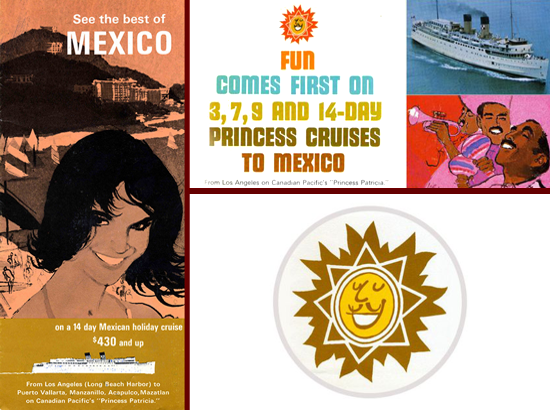 In 1967 they chartered a more specific cruise ship, "Princess Italia", and in 1968 the third "Princess Carla" ship, thus continuing the series of Mexican Riviera cruises. 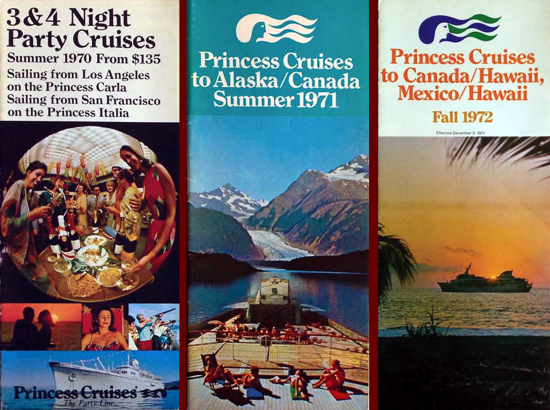 In June 1969 Princess Cruises inaugurated the first series of summer cruises to Alaska. Interesting facts: In 1962 entrepreneur Stanley B. McDonald bought a ship, the cruise vessel "Yarmouth", to operate as a hotel at the World's Fair in Seattle, where his company Air Mac provided all the ground transportation equipment; the ship sailed from San Francisco to Victoria B.C., then down to the fair for a 10-day cruise. For four days of the cruise the ship was used as a hotel while people onboard visited the fair. This experience inspired McDonald to try a new businness, so in 1965 he decided to found Princess Cruises. The popular American television series "The Love Boat", aired on the ABC Television Network from 1977 to 1986, was set aboard many of Princess' ships in destinations around the globe; the two ships featured heavily were "Pacific Princess" and "Island Princess". To celebrate their 50th Anniversary, on December 3, 2015 Princess Cruises reunited The Love Boat cast aboard Pacific Princess in the Port of Los Angeles. Quote (Stanley B. McDonald): «The call of the "Mexican Riviera" was coined by our people as I remember. Now everyone refers to it as the Mexican Riviera». 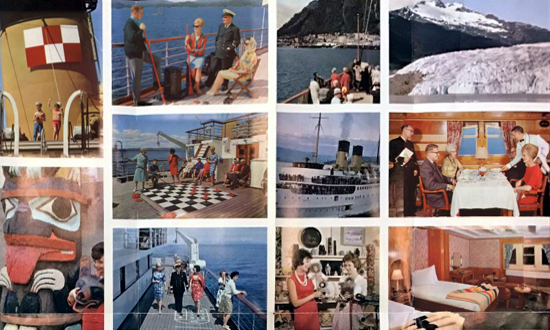 Property: Princess Cruise Lines, Ltd.
Princess Cruises before Princess Cruises (summer 1965). 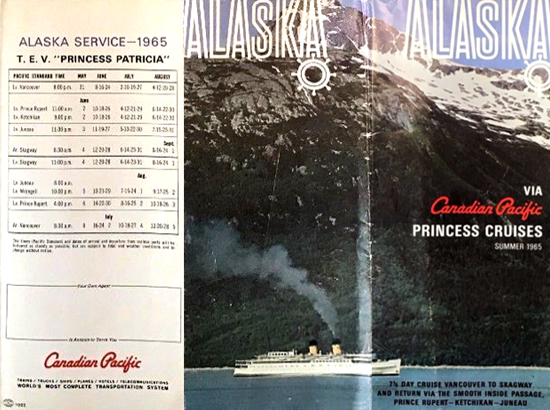 This brochure offered 7-days summer cruises in Alaska - from May to August, from Vancouver to Skagway and return - aboard Canadian Pacific's "Princess Patricia", the first ship chartered by Stanley McDonald in the fall of the same year to start his businness. The Princess Patricia was a very popular, reliable ship: despite its tiny size, it had eight sumptuous wood-paneled suites with large living rooms, a large selection of outside upper/lower berth cabins, and outdoor activities included shuffleboard played atop decks. 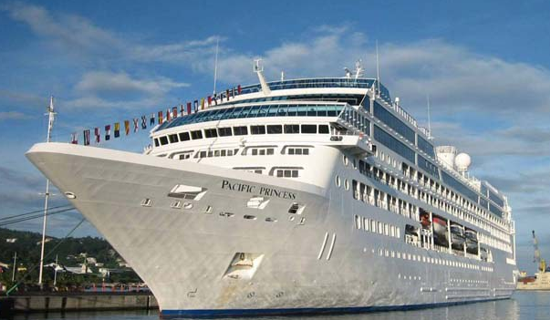 Princess Patricia, the first ship operated by Princess Cruises, docked in Vancouver during the first Princess Cruises management. On December 3, 1965, Princess Patricia's first cruise took 400 passengers from Los Angeles to Mexico, calling at La Paz, Puerto Vallarta, Acapulco and Mazatlan, thus inaugurating the first series of 14-day cruises to Mexico, until april 1966. 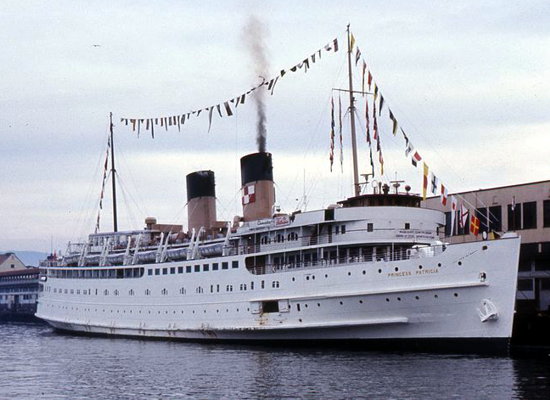 This Turbo-Electric Vessel, 6,082-ton, 356-by-56 foot, built in Scotland 1949 and converted to cruise liner in Canada 1963, returned under the Princess banner for a second Mexican Riviera cruise in winter 1966/67, before being left to the exclusive management of its owner Canadian Pacific. Demolished in Taiwan 1995. 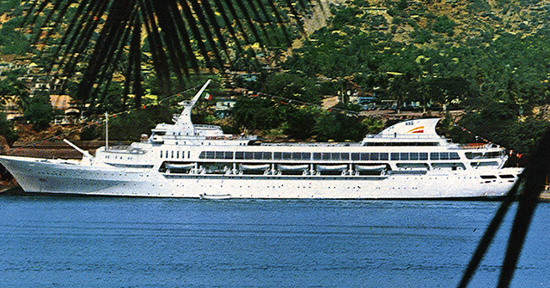 Princess Italia, the second ship operated by Princess Cruises, in Acapulco (1967, under charter to Princess but still with Oltremare's triangle funnel logo). Princess Italia made her maiden departure from Los Angeles on December 15, 1967. This cruise ship, 12,083-ton, 489-by-68 feet, 452 passenger plus 240 crew, was built in Italy 1967 as "Italia" for Crociere d’Oltremare, then chartered by Costa Lines and subchartered to Princess Cruises, who marketed her as "Princess Italia", but never officially renamed her. 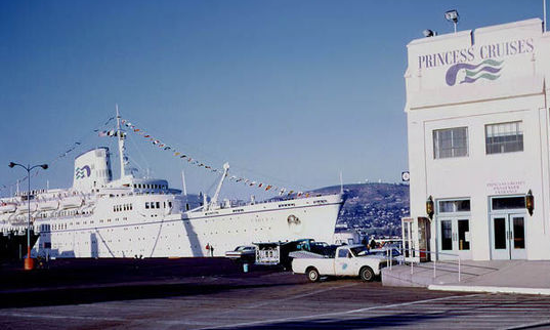 On June 3, 1969 Princess Italia was also used for the first Alaskan cruise from San Francisco. Demolished in Gujarat, India 2012. Princess Carla, the third ship operated by Princess Cruises (1968). Princess Carla made her maiden departure from Los Angeles on December 19, 1968; it was the first vessel to carry the iconic "Seawitch" funnel logo. This cruise ship, 20,469-ton, 600-by-80 feet, 452 passenger, was built in France 1951 as "Flandre" for French Line, then sold in 1967 to the Italian firm Costa Cruises, who renamed her "Carla C". In 1968 the ship was chartered to Princess Cruises, who marketed her as "Princess Carla", but never officially renamed her. Demolished in Turkey 1994. Princess Cruises 50th Anniversary (1965-2015). On December 3, 2015, Princess Cruises celebrated their 50 years recreating the exact route of the cruise line's original Princess Patricia's maiden voyage (December 3, 1965) - from Los Angeles to Mexico - on board the 30,277-ton Pacific Princess (above).